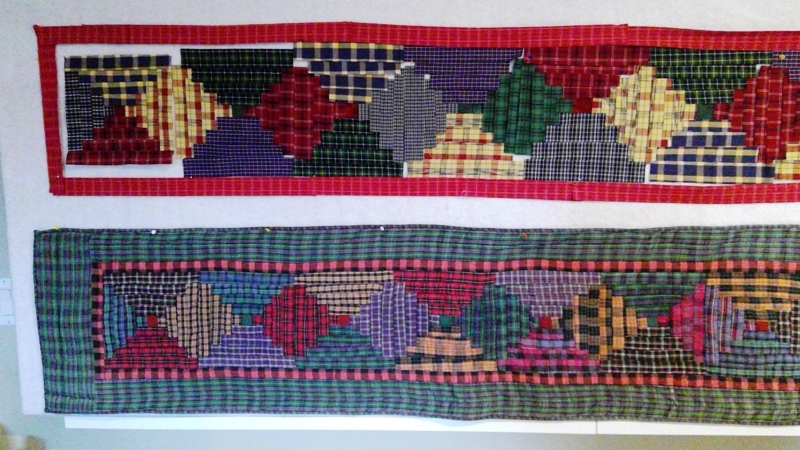 Several weeks ago a friend asked if I could make a replacement for her table runner. It was worn out, faded, and yet loved. She worried that I would not be able to find similar plaid fabrics. When I brought it home and pulled out my small stack of plaids, I was amazed to find matches. They are not exactly the same designs, but the scale works. They are also brighter, which is what she hoped for. Even though 'faded' can be charming, she was wanting a fresh look. This photo has the older runner on the bottom, and the parts and pieces of the new one on top. I worked on this most of yesterday afternoon, cutting all the strips and moving them around until I liked the result. In the photo, they are rather loosely arranged. I used a paper foundation and finished the block on the left. It is fairly easy. 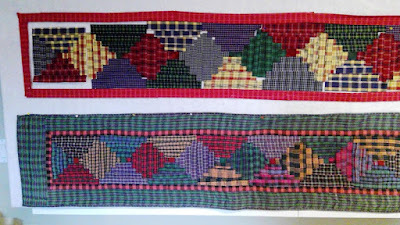 The outer border is not cut yet because I've two plaids that will work, and haven't decided yet which one to use. I hope my friend likes it!